Hooray!!! Betty's back Betty's back!! Woot woot! Sending you lots of love and warmest wishes for a wonderful Birthday Betty! Happy Birthday and many many happy returns Betty!! I'm very glad you are back! Happy birthday! May 2012 totally rock for you! AW Betty's back and with a pretty bow! Happy birthday Betty, here's to a great day spent with friends and cake. Lots and lots of cake! Yay for Betty! I've been *patiently* waiting for your comeback! Happy Birthday and have a wonderful day!! HAPPY HAPPY DAYS ARE HERE AGAIN!! YES WE'RE SHOUTING!! WHEN MY SIS WAS A WEE LASS AND HAD TO NAP (WHICH SHE HATED) SHE WOULD ASK MOM HOW LONG SHE HAD TO NAP. MOM TOLD HER ABOUT 2 HOURS WHICH WAS AN ETERNITY TO HER. INSTEAD OF SAY SHE LOVED THE PEEPS A BUNCH SHE STARTED TELLING THE PEEPS SHE LOVED THEM 'TWO HOURS AND A BUNCH'. TO HER THAT WAS THE ULTIMATE AMOUNT OF TIME AND DEVOTION! 'TWO HOURS AND A BUNCH'!! Oh, Betty I'm so glad you have reclaimed your freedom of speech. I checked this morning thinking it just might be the day you came back to us, and was so happy to find you. May this birthday truly be the birth of a new day for you. I'm glad you are back, Betty. It's good to know you are alive and kicking. Christmas is the worst, pally, and you MADE IT!!! Happy Birthday, my friend. May this year ahead bring many good surprises, strength, love, and most of all.....happiness. I wish it all for you! Good to have you back. Hope this birthday is full of unexpected blessings and wonderful surprises! Welcome back! 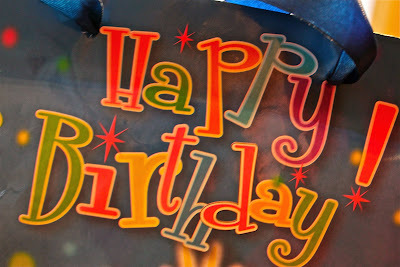 I wish you a very happy birthday today! Hope to hear about your celebration in a future post! Today I wear my bow with pride! Cos it's your birthday and I'm in for the ride! I am so thrilled to see you back to blogging! Now pass me the salad and the coconut dressing! HAPPY BIRTHDAY my dearest Betty!!!! My heart is so happy seeing you back today. And, while I know this isn't really about ME [to which I say, "why not?" ;)], I do want you to know that my life is a richer, better place with your words in it. HUGS, my dear friend! Happiest of Days and Years for you, always!!! Betty! I'm sooo glad you're back and just in time. I was almost tempted to feel sorry for myself about some silly thing that happened in my life and here you are with your wonderful header photo and words of love and encouragement, showing us life goes on. So, Welcome Back! Big Hug! Happy birthday ma'am. I hope you see lots of sun there. Oh, and Happy Birth Day! Yay! You're back! Happy Birthday, Betty. It's good to read you again. YAAAYYYYY!! [Kermit-the-Frog style arm flail] My subconscious must have been telling me to prepare myself 'cause Betty's rrrrready to rrrrrumble! Welcome back, Betty! It's so good to see you back here! And happy birthday to you! I was lost but now I am saved.It has been so lonely without your wit and wisdom.Happy Birthday!!!!!! Good to see you back! And a very Happy Birthday! I'm glad you invited us to wear shiny bows - that makes the day sparkle. Happy Birthday Betty! We love your present, it's purrfect, we've been missing you! Happy Birthday, and Happy New Life! Happy Birthday and bless you for being strong enough to come back! Let's put last year in a box and ship it away! I am TRYING to be more positive this year, it's all I can do. Thinking of you, and so glad to see you back! Wonderful to see you back, Betty. Wishing you the happeiest of birthdays.. the first of those which get better every year. Now blow out those candles, willya? Happy, happy Birthday, Betty! Welcome back! Happy Birthday Betty. We sure hope you have a fantastic day and many more of them. We have missed you and glad you are back with us. Hope you have lots and lots of treats today. Take care. Oh Betty, you've made it like my birthday by returning to blogland! I am so thrilled you've returned and sporadic is fine as long as we keep getting...More Betty..puhlease! nice...welcome back betty...and happy birthday to you as well! hey how is school going for your son? Happy birthday, Betty! You have been missed. Big time. Hurrah!!! Hurrah!!! Betty's back... I've searched for you everyday and kept hoping you'd soon return. Today's a great day!!! And a great day for a BIRTHDAY!!!! Happy Birthday, Betty!!! SOOOOOO glad you're back!!! Happpy Birthday to you, Betty!! I'm so glad to see you back!! I've missed you!!!! Wonderful to see you! Happy Birthday! I was looking at my blogroll last night and noticing you still hadn't posted... in like, forever. Now, forever is over and you're back! Wishing you a very happy birthday, Betty. It's so good to see you back on the blog. We've missed you. Happy Birthday, and welcome back! Do be doo be doo! Our girlfiend's back! Yay!!!! Happy Happy Birthday Betty!!! May all the wishes you make on your birthday candles come true!! Happy Birthday to you! I hope this is a wonderful day and all of your wishes come true! Oh.my.gosh... It's so great to see you! Happy Birthday, Betty!!! Knowing you share the same birthday as someone very special to me, makes you even more special than you already are! Thank you for dropping in and leaving the kind words! A very happy, happy birthday Betty. Great to have you splashing around in the blogpool again! You were missed! Happy, happy, happy Birthday. I'm so glad to hear from you again. Yea!!! Betty's Bday!! Happy Birthday and I'm so glad we will continue to see your wonderful name and face! I wish you all the best and hope to see things growing better and better each day. You are so worth knowing...thank you for being...BETTY! The red bow I'm wearing in your honor suits me nicely--hope it doesn't pull out chunks of hair when I take it off. Oh well, the Happiest of Birthdays to you! I swear, I was JUST thinking about you last night and wondering where you've been. Glad to hear that you are back and things are going okay. Lots of hugs from the East Coast. Have a wonderful birthday--celebrate all week long! Glad to have you back in the blogging swing! I give you a rousing round of applause as you enter back into the land of blog. Happy Birthday! I have missed you but knowing you were maybe out galavanting as needed sure helped me curb my impatience! Yay!! You're back!! Welcome back and Happy Birthday!! I hope you have a WONDERFUL day!! Hey BB...Welcome back and Happy Birthday. SO good to see you. Y'know, we were talking about you this weekend. Were your ears ringing??? Coherent or not, we're all here for you. Actually, the non-conherent can be pretty funny, y'know!!! Good to see you back, friend. Yay, Betty's back!! Happy Birthday! I'm a January gal, too! So good to have you back, Betty...as you can see from all the comments, you've been missed!! And you, BB, are a gift as well. May this birthday be the start of something wild and wonderful. Hope you had a wonderful birthday, Betty!! Welcome back, and a very Happy Birthday to you!!! betty! two of my comments: blogger says "conflicting edit." Happy birthday, hope this one goes through. Happy Birthday, Betty! So glad you're taking the plunge into the blogpool again! I was just checking your blog yesterday and noticed the header had changed ... so I was hoping ...!! and a very hearty welcome back to blogging... I have missed your wit. this sure is good news to me! We go back a long ways in the blog world and it was different and not as much fun with you gone. I was tickled when I saw your comment on my blog today! Above all though, I'm happy to hear that you are doing and feeling better my friend. Oh yeah! Well. you have not lost your talent and clearly your followers have been waiting in the wings! Bet you never sneak off again. Happy Birthday oh wise one. Happy Birthday!! Glad you are back! Sorry I'm late, but that's about typical for me and birthdays! Hope you had a happy day, Betty, and I'm so very glad to see you back blogging again!!! Hi Betty - Happy Birthday - and here's to a better year ahead .. more settled, less stress and much happiness, despite all.